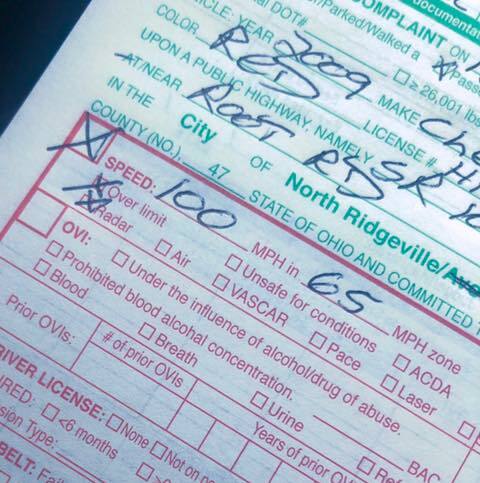 An officer with the North Ridgeville (OH) Police Department recently stopped an 18-year-old driver going 100 miles per hour in a 65 zone. After he issued the young man the ticket, he posted a picture of a part of the citation on Facebook, along with an epic open letter to the young man. "You’re welcome," the letter began. "I’d like to believe that you were minutes away from creating an unspeakable Christmas tragedy when I stopped you. If not only killing yourself, you were well on your way to killing some innocent person who was minding their own business doing nothing else wrong but being in front of you." The officer admonished the driver for lying about not realizing he was going so fast. "You may not realize when you’re doing 45 in a 35 but you are fully aware of every mile per hour at 100. You realize it with every bump you hit," the officer wrote. The letter continued, "You were scared when I stopped you. You were visibly shaking and breathing hard. Unfortunately, you were scared one minute too late and for the wrong reason. You should have been scared that you were trying to kill yourself. I know you’re invincible. I know that you can’t even fathom your own death." The officer closed his missive with the admonishment that he had seen too many "dead and broken 18 year old bodies" at accident scenes, and that he did not want to have the unenviable task of family notification that yet another young person had needlessly died from excessive speed on the roadway. "I hope that when your mom tells you to 'drive safe' you make a promise to her, and yourself, that you will. I hope you can envision me sitting in your kitchen telling your screaming mother that you have been killed." The letter ended, "Slow down. Please. You are not invincible. I promise."